TRIPOLI, Sept 2, 2011 (AFP) - Libya's strongman Moamer Kadhafi issued fresh threats and urged guerrilla warfare, as world leaders unblocked $15 billion in funds to help Libya's victorious rebels rebuild their shattered country. Forty-two years to the day since he took power in a coup, Kadhafi, who might once have marked the anniversary with pomp and ceremony, was reduced to releasing his latest bluster on tape late on Thursday. "Prepare yourselves for a gang and guerrilla war, for urban warfare and popular resistance in every town... to defeat the enemy everywhere," he said from his desert hideout in the audio tape aired on Arab satellite television. 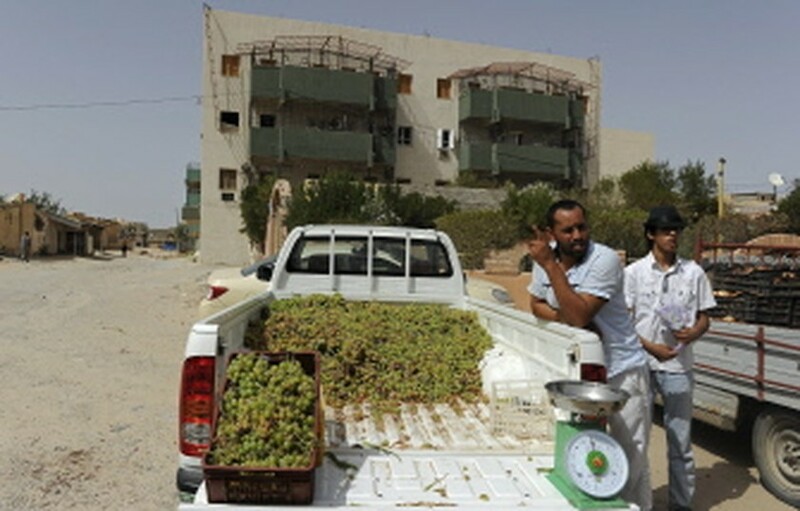 AFP - Vendors sell grapes on Tarhuna's main street, some 100 km southeast of Tripoli on September 1, 2011. Kadhafi and his son Seif al-Islam have gone underground since rebels stormed into Tripoli on August 20. "If they want a long battle, let it be long. If Libya burns, who will be able to govern it? Let it burn," declared Kadhafi in his statement. "Even if you cannot hear my voice, continue the resistance ... We will not surrender. We are not women and we are going to keep on fighting," he said. His message of defiance came as senior envoys from over 60 countries were meeting the leaders of the revolution that overthrew him to endorse the fledgling regime and offer practical support. But in Thursday's meeting in Paris, they also put the leaders of the rebels' National Transitional Council (NTC) on notice to pursue a path of reconciliation. The Paris guestlist was a victory in itself for the NTC, as once sceptical Russia and China and Libya's reluctant neighbour Algeria agreed to back the new administration. French President Nicolas Sarkozy, the rebels' most prominent backer from the outset, announced that billions in Libyan assets frozen abroad will now be unblocked. "Around $15 billion have been immediately unfrozen... we want to give back to the Libyans the money that was frozen and that was stolen from them," he said. Speaking alongside the rebel leaders, Sarkozy urged the NTC to begin a "process of reconciliation and forgiveness." NTC president Mustafa Abdel Jalil said the Libyan people "proved their courage and their determination" in their fight to topple Kadhafi, but he also pleaded for stability. The rebels have issued an ultimatum for Kadhafi and his followers to surrender, and have amassed troops around his hometown of Sirte for a final battle. They say Kadhafi may be in the town of Bani Walid, south of the capital and still held by loyalist troops, but other reports suggest he could be in Sirte or Ghadames, near the Algerian border. A senior rebel leader dismissed his latest statements as a reflection of his "despair" at the success of the insurgency. "Kadhafi's speech is a sign of misery and despair," Ahmed Darrat, who is overseeing the interior ministry for the rebels until a new government is elected, told AFP in Tripoli. While the mood in Paris was upbeat, US Secretary of State Hillary Clinton sounded a note of caution, urging the rebels to beware of extremism in their own ranks and prevent weapons from falling into the wrong hands. "Roughly 860,000 people have left the country since February, including skilled guest workers. Public services are under severe strain... There is a major water shortage." Russia -- which had opposed NATO military support for the rebels -- said it recognised the NTC as Libya's "ruling authority." China, which also had reservations about the air campaign, did not go so far, but said it respected the NTC's "significant position." Continental heavyweight South Africa, however, continued to snub the NTC. President Jacob Zuma boycotted the talks and said he was "not happy" with NATO's campaign. The African Union has not recognised the NTC. The Algerian turnabout may prove of more immediate practical help in cutting off a potential Kadhafi escape route. Libya's larger neighbour has been accused of supplying Kadhafi with arms and, after members of the fallen leader's family fled there, it was seen as a likely escape route for the strongman and his loyal sons.